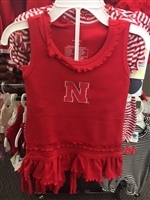 Check out this adorable new infant romper from Cowgirl Tuff! 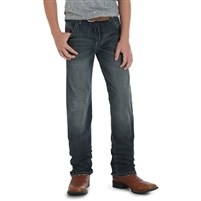 These Boys George Strait jeans have authentic five pocket styling and now have an adjust-to-fit waistband. They are 100% cotton and made from a heavy weight broken twill denim. Heathered green cotton-poly crew neck tee featuring a front chest pocket and back CINCH number screen print. Complete any casual outfit with a CRUEL Denim Aztec-designed mesh back trucker cap. Created in navy and soft shades of pink with contrasting bold pink stitching, this cap offers sun protection and breathability on a warm day. Constructed with easy snap back closure. Dress your little tag-along in a bold red tee shirt that makes him feel like one of the big guys. Our short-sleeved crew neck made with soft cotton jersey material features a creative bull riding front screen motif and Legend In The Making slogan. This Twister cowboy hat from M & F Western Kids is perfect for the bull rider in training. 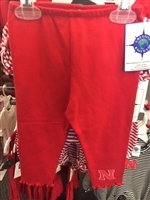 Wrangler presents the cutest red plaid onesie. 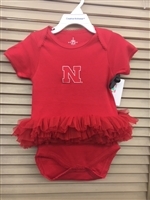 This onesie has along sleeves, a collar, and a bottom buttons. 64% Cotton / 34% Polyester / 2% Spandex - Machine Wash. This light gray and purple cap with 3D logo embroidery will add cutting-edge style to the closet. 60% Cotton and 40% Polyester.Machine wash cold. This will make your little one look like a true cowboy! This Ariat boy's belt by M&F Western Products features brown rowdy leather with western floral tabs. This kids belt is also made with a removable silver toned Ariat buckle. 100% Premium Cotton. Officially licensed by college NCAA. High-quality denim and premium details are the staples that make these jeans so popular. With energy to spare, your young cowgirl can Party Till The Cows Come Home in our purple 3/4 sleeve heathered raglan tee. Made in comfortable and long-wearing cotton-poly jersey material, this shirt features a bold front screen print and is a perfect weekend choice. This Hooey cap has a white meshback and a sky blue front, with the Roughy logo stitched in silver and white!